Canadian Prime Minister, Justin Trudeau (fourth from left) and Immigration Minister Ahmed Hussen (right) met with Board Members of the Operation Black Vote Canada, from left to right: Ian Allen, Vice-Chair; Marva Wisdom, Director at Large; Wendy Vincent, Director of Communications; Velma Morgan, Chair; Joseph Smith, Director of Youth Outreach; and Nicole Miller, Director of Outreach and Events. Photo contributed. 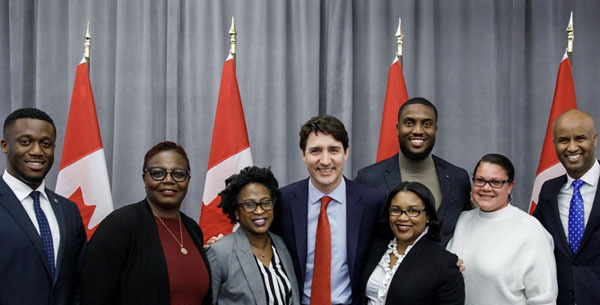 TORONTO, Ontario February 27, 2019 — Members of the Board of Operation Black Vote Canada (OBVC) — an organization that supports the election of Black Canadians to public office — met with Prime Minister, Justin Trudeau, and Immigration, Refugees and Citizenship Minister, Ahmed Hussen, last Friday, February 22. The meeting was an opportunity for OBVC to introduce the organization and its agenda to the Prime Minister, as well as to reiterate its accomplishments to Minister Hussen, who has participated in OBVC events in the past, the nonprofit and multi-partisan organisation said in a release, today. The meeting was also intended to be a discussion on OBVC activity, in anticipation of the 2019 federal election — scheduled to take place on or before October 21 — including providing details about OBVC’s initiatives, such as its current Dinner+Politics campaign, added OBVC. “We welcomed the opportunity to engage with the Prime Minister and the Minister for Immigration, Refugees and Citizenship, the Hon. 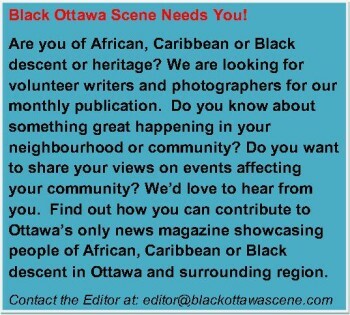 Ahmed Hussen, about Black Canadian civic engagement,” Velma Morgan, Chair of OBVC explained. “Having held a similar meeting with NDP Leader, Jagmeet Singh, engaging with Canada’s political leaders aligns with our larger task of expanding Black political access and participation,” she added. 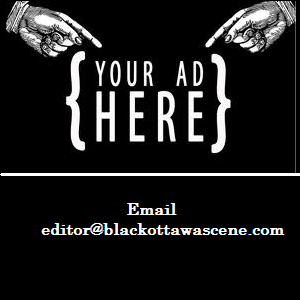 As the October election draws closer, the organisation, which was founded in 2004, says it intends to work, across all parties, to increase the nomination of Black candidates, and to continue engagement, focused on increasing overall civic participation among Black Canadians. 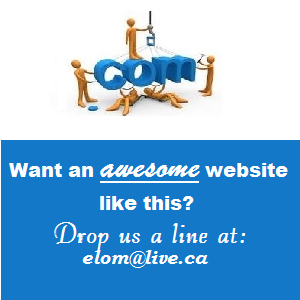 With a mission statement of simplifying and demystifying the path to public office and civic engagement, the OBVC accomplishes its objective “by educating, motivating and advocating for our greater participation in Canada’s government, agencies, boards, commissions, civil service and in Canada’s political process at all levels”.